With March Madness, we’re in the midst of prime “dip” events. 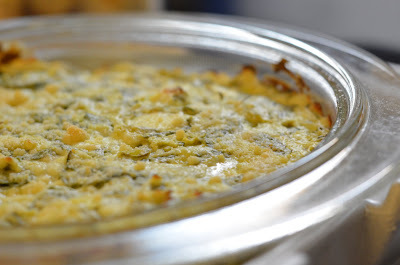 I actually first made this dip for a previous Superbowl, and then made it again to take to a friend’s house to watch a boxing event. Honestly, I don’t understand the enjoyment of watching boxing. Watching men cause each other permanent brain damage just doesn’t excite me. At least I enjoyed the dip though! Preheat oven to 350 degrees F. Lightly grease a small baking dish. In a medium bowl, mix together cream cheese, mayonnaise, Parmesan cheese, Romano cheese, garlic, basil, garlic salt, salt and pepper. Stir in artichoke hearts and spinach. Transfer the mixture to baking dish. Top with mozzarella cheese. Bake in preheated oven for 25 minutes, until bubbly and lightly browned. 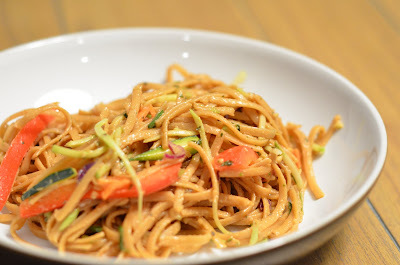 I have a thing for peanut noodles, and we actually made another recipe this week that was freaking awesome that will also be shared shortly. In the meantime, this version was also pretty darn delicious and chock full of veggies. My only change is that next time I would increase the peanut butter and decrease the water slightly to add a little more body to the sauce which is reflected below. The original version had chicken, and well, that didn’t quite happen for reasons aforementioned, but I don’t think either of us missed it! Combine all the dressing ingredients, except peanuts, in a food processor and puree until smooth. Add the peanuts, and pulse a few times until coarsely chopped. Season with salt and crushed red pepper flakes to taste. Combine all the salad ingredients in a large bowl. Add the dressing to the salad ingredients, and toss to combine. Top with cilantro and basil before serving.